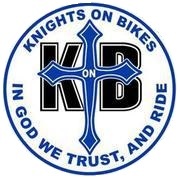 We want you to be aware of our mission and who we are.Knights on Bikes were started by Raymond Medina, Willie Davidson, and Freddie Galindo in Ft. Worth TX in June 2005. Our group was started to promote the Knights of Columbus and safe motorcycling. The group has expanded since those humble beginnings to Knights joining us from Canada, Mexico and the Philippines and multiple states in the United States. Our group has no dues or bylaws and is a part of the local councils. We operate under the control of our local councils. We do have guidelines that we follow to make sure we are not considered a separate group from our local, diocesan, state, or national Knights of Columbus. Our members must have attained their 1st degree membership of the Knights of Columbus, own a motorcycle or have a motor within 6 months of joining, follow the tenets of the Knights of Columbus. Our ultimate goal is to enjoy motorcycling with fellow Knights who have the same interest, while evangelizing to those in the motorcycle community that we come in contact. We also want to recruit candidates into the Knights of Columbus that happen to be motorcyclist. Many of our members are officers in their local councils and assemblies and participate in the various charities supported by the Knights. There also have been articles in Oklahoma and Florida about the charitable contributions that have taken place with our KonB members. We have given vests to Carl Anderson, Cardinal Di Nardo of Texas, Bishop Farrell of Dallas, and Bishop Van previously of Ft. Worth. We believe we are a valuable asset to the Knights of Columbus and would like to be chartered or recognized as an integral part of the Knights of Columbus. We would like to be approved by the Supreme Council as acceptable for Knights to join if they so choose. We see ourselves in the spirit of the guideline of the pastoral care of the road from the pontifical council of the pastoral care of migrants and itinerants. Supporting their faith are the Catholic motorcyclist. We are part of a fraternal organization focused on charity and evangelization. We are focusing specifically on responsibility of the baptized faithful that has not been to church?s primary focus in the past which is the motorcycle community.